I will meditate on the glorious splendor of Your majesty and Your wonders. It opened in a way I never saw a tulip open! On my Shabbat table, I also had a book open called The Mighty Works of Jesus. This Tulip opened so splendidly!! Next to the tulip, on my table I had been reading THE MIGHTY WORKS OF JESUS. It is a book by Wesley Scott Amos we are reading in my worship dance studies. Seeing the Tulip open like that was so wonderful, an expression of His Mighty Works of Creation!! This week with watching the tulip I realized how my Shabbat table takes on new life in the week, as the things seem to have a new light after having partaken in Shabbat! So I share a few views of the Shabbat table from this week, including some drawings and an Israeli grapefuit, now we see them in almost all the supermarkets! and of course, the Tulip! Give praise to our Maker, Glory to God! Praise the LORD Jesus, Yeshua our Messiah, for His Mighty Works!! Challah, like Manna, raining down from heaven over our city!! Remember the construction worker with the gold helmet, painting planks gold under the blossoms during the week of Parsha Terumah! *Thank you Duta for your giving this `protagonist` expression for the tulip! 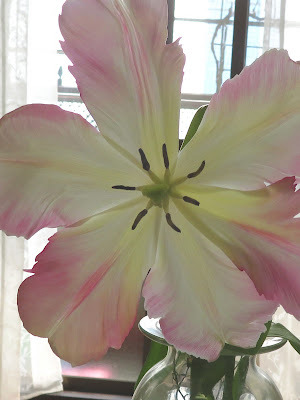 **I heard that my blog friend Sandi had a similar tulip, just the reverse in colors. *** for The MIGHTY WORKS OF JESUS by Wesley Scott Amos, follow this link HERE. *****for the first post about the Tulip, see two posts down! I've never seen a tulip open so fully before. That is very special. 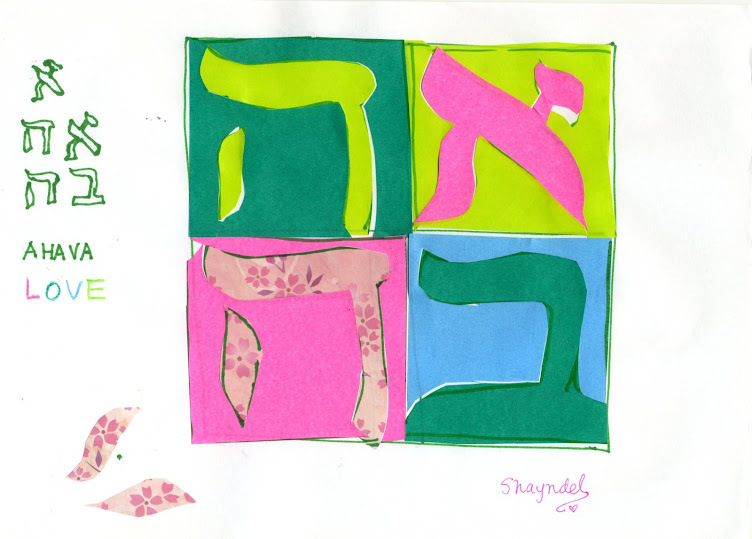 The Shabbat art is lovely. You are gifted at making these creations each and every week. The grapefruit looks very lovely too with it's ruby red colour. Happy week ahead and Shabbat Shalom. Such lovely sketches! especially the one with the challah like manna, pouring down over the city. You should do something about these sketches, compile them in a book, or something. I fell in love with them. Thank you Duta!! Wow, I am so encouraged to hear that. I would like to, and have thought about making some kind of book, know I need to take a next step of some kind, just unsure of what that step is, so your comments are a "call to action" and encourage. I so appreciate that. ... Blessings!